It's not hard to find a decent chassis these days - the market is as competitive as ever, and there are multiple brands serving up an array of enclosures designed to service almost every need. But what if you want something more? 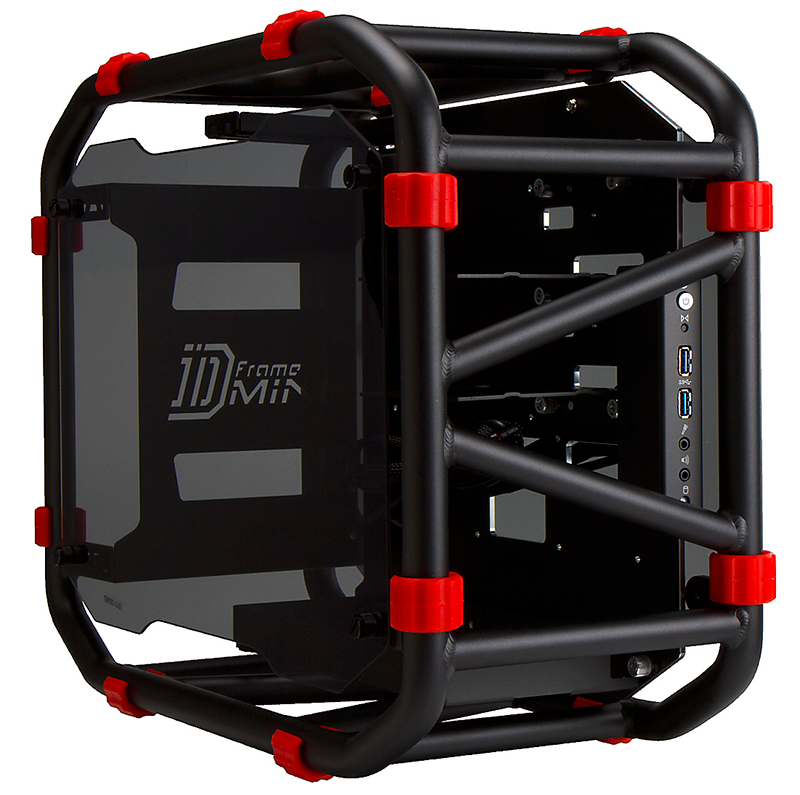 What if you want a chassis that's completely different to the norm and will ensure heads get turned when you next arrive at a LAN party? If that sounds like you, then consider turning your attention to In Win, who over the years has developed a penchant for eye-catching designs with its X-Frame, H-Frame and D-Frame solutions. All three were fabulous to look at, but herein lies a problem: if you're building a PC that's designed to be shown off, it surely needs to small and portable enough to travel by your side. 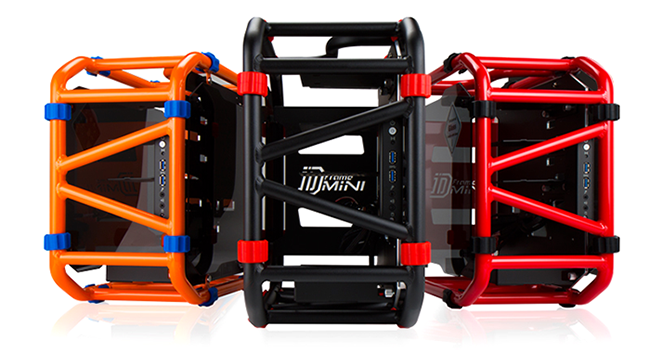 It's a first-world dilemma, for certain, but the Taiwanese outfit reckons to have cracked it with the D-Frame Mini. Like its predecessor, this open-air chassis is about as unusual as they come, and rather than conform to typical chassis requirements - you know, minimise dust, channel airflow and reduce noise - its primary ambition is to look cool. 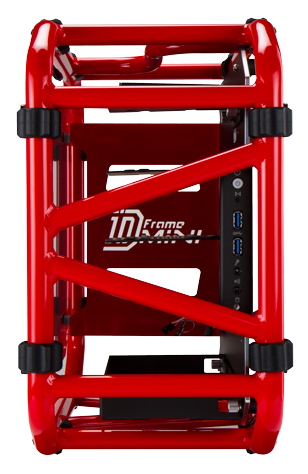 And sure, the D-Frame Mini won't be everyone's cup of tea, but can you honestly say you aren't just a wee bit curious? Neither could we, so we've decided to take a closer look. 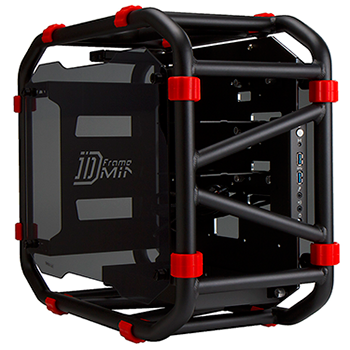 Let's start with the elephant in the room: In Win's D-Frame Mini costs £250, and whichever way you look at it, that's a chunk of money for a Mini-ITX chassis. 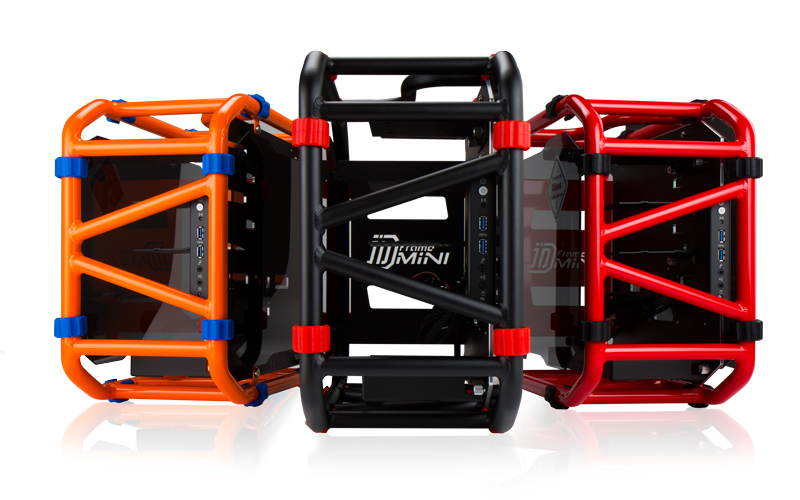 We're talking a very niche audience, there's no doubt about that, but if you're willing to splurge you'll appreciate the fact that the D-Frame Mini is available in a choice of colours: glossy orange; glossy red; or matte black. The latter is the most stylish, we feel, but for reasons we can't quite put our finger on (HEXUS colours - ed), we're naturally taken by the orange with blue highlights. Measuring 405mm x 230mm x 501mm in size and tipping the scales at 5.3kg, the D-Frame Mini is both larger and heavier than we'd anticipated. It's smaller than a mid- or full-tower chassis, of course, but it isn't quite as diminutive as other Mini ITX solutions. Portability however is good, thanks primarily to a textured carry handle at the top that makes it easy to get the chassis from A to B. 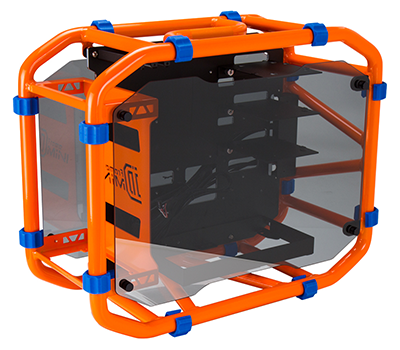 Build quality, too, is impressive, with In Win using aluminium tubes that are neatly welded together, along with an aluminium motherboard tray and tinted, tempered glass for the floating side panels. A total of 16 rubber standoffs line the perimeter, helping protect the tubing from scratches and allowing the chassis to be oriented in just about any direction. One surprising element of the D-Frame Mini is that it arrives as a pre-assembled unit ready to accept your components. Most users will probably consider that to be a good thing, but we're not so sure - we quite liked the fact that the original D-Frame was delivered in pieces, as putting it together was half the fun. Perhaps we're just strange in that sense. In contrast, the Mini is ready to go from the moment its unboxed. Unfastening four thumb screws reveals access to the internal cavern, where you'll find a 90-degree-rotated layout. 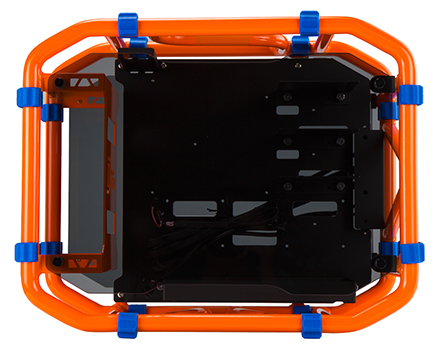 Looking into the chassis from the side, a dedicated power-supply bay is located to the left, mounting points for a Mini-ITX motherboard are in the middle, and three 2.5/3.5in drive bays are on the right. It's a minimalist arrangement, with no support for 5.25in optical drives and no bundled fans, but the quality of what is included is reassuring. The aluminium used for the motherboard panel and drive trays is suitably thick, and though there's plenty of metal involved, there are no overly sharp edges.